We’ve just finished our garlic harvest. It matured a week earlier than usual and there was no arguing with it! 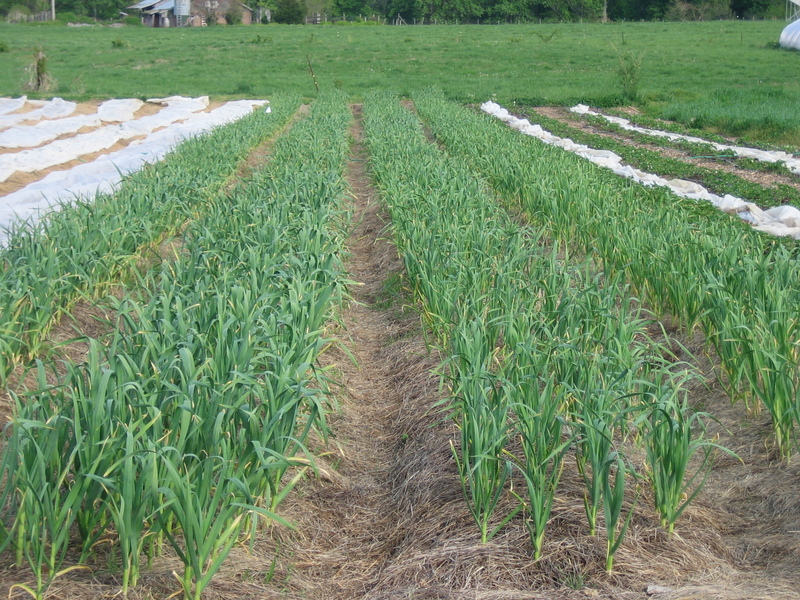 Most of our garlic is an unknown hardneck type which we’ve been growing for years. We save our best bulbs for replanting. I watch the tips of the leaves, and when several are brown, but we still have several green-tipped younger leaves, then I do my second ripeness test. I pull up a few and cut them open across the middle. As soon as I see air spaces between the cloves and what’s left of the stem in the center, I know it really is time to harvest. This year we started 5/31. it takes us many days at an hour or two a day, with a big crew, to get them all up and hanging in the barn. And as soon as the big hardneck planting was cleared, we disked the patch and sowed buckwheat and soy cover crop. This area will be planted in fall carrots at the end of July and it really pays to minimize the weed seed in carrot beds before planting. I was happy to get the cover crops sown just before the last rain. And then we moved on to harvesting our softneck garlic, Polish White. Some of it had a mold problem while growing, but most of it is still good. We finished yesterday. This entry was posted in This week in the garden and tagged farming, gardening, garlic, harvest, plants by Pam Dawling. Bookmark the permalink. How cool to find your post the very day I did my own garlic harvesting (admittedly on a much smaller scale). It was even cooler to find out that you’re the head vegetable gardener at Twin Oaks. I’ve visited your gardens a couple of times (I live only a few counties to the east), but unfortunately I never got to meet you and tell you how much I admired them. I’m going to enjoy checking your blog and getting lots of tips for my central Virginia garden! And I look forward to seeing your book early next year. How strange to blog to the world and get a response from an almost-neighbor! Maybe see you at next February’s VABF Conference? Hope your garlic turned out good! I’m starting to wonder when my garlic harvest will be this year. Spring was very early in west central Illinois.